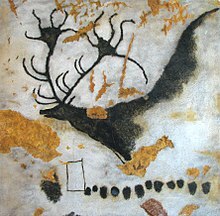 Pluais bheag phailéiliteach shármhaisithe ó timpeall 15,000 RC is ea Lascaux, agus é suite gar do Montignac in iardheisceart na Fraince. Cáil uirthi as an bpéintéireacht is an ghreanadóireacht nádúraíoch mhúrach d'ainmhithe: ba, tairbh, capaill, buabhaill, ibigh, muscdhaimh is reinfhianna. Tháinig daltaí scoile uirthi i 1940, agus osclaíodh don phobal í i 1947. Ach thosaigh athruithe sa taise ag bagairt ar na pictiúirí, agus dúnadh go buan í i 1963. Tógadh macasamhail di in aice láimhe, atá ina hionad cuairteoireachta ó 1984. Tugadh an leathanach seo cothrom le dáta an 28 Meán Fómhair 2018 ag 17:26.